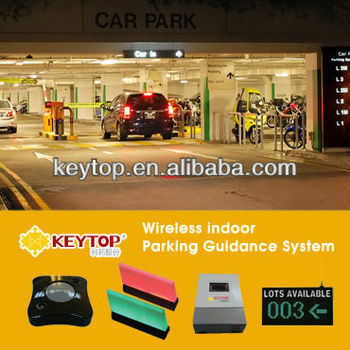 1.How Wireless Parking Guidance System Work? Thirdly, several wireless sensors will support one wireless led indicator,if all occupied,it will be in red;if any of them is vacant if will be in green. causing by different setting angles without error accumulation. vehicles. Both of them are available for all kinds of car park's terrain. 4. The instruction's process chip and memory chip of UD has the function of storing different setting values(keep address setting and self-adapting setting etc. ),so it is unnecessary to reset after power-down. control of led indicator is available by transmitting interrelated commands to UD. note the UD manual for more details).The color of LED indicator is optional. 6. Using bus system with three layer construction (CCU,ZCU,UD),so the structure is very simple and it is easy to install and maintain. It also can operate without PC and will be not influenced by PC problem. 8. Base plate of UD:it can swing 15 degree to be installed forward and backward, so angle's variation improves its detection accuracy rate. 9. Network Wire Connection: Using network wire to connect the components of PGS makes the installation easier and reduce much installation time and lower the connection error. it will be off, which will reduce 25%-33.3% of car park's energy charge.